Ready-Made Choose from a wide range of pH buffers in different sizes, transparent or color-coded for easy recognition. You can also obtain these new alkaline solutions in specially designed cases of 16 x 230 mL or 12 x 460 mL bottles for better safety and storage. The HI 7010L/C and HI 8010L/C are now supplied with a certificate of analysis. 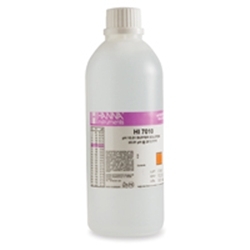 NIST Traceability Hanna pH 10 ingredients are carefully weighted with the highest quality Sodium Bicarbonate and Sodium Carbonate. They are standardized with a pH meter that is calibrated to NBS/NIST primary standard buffer solutions and the pH value is traceable to NIST 191a and NIST 192a S.R.M. FDA Approved Material FDA-approved opaque bottles of HI 8010 series of Hanna buffers stop light from interfering with the solutions' carefully balanced value.